The only plan we had for today was to get from Point A to Point B, simple enough, right? Only this is the first time I've taken a vacation and not made hotel reservations ahead of time. We didn't have them on the move south but that was mainly because we didn't know where we were going to end up each night. Now I'm hoping that we can find cheap lodging in places that don't bother to advertise on the internet. We slept in a little bit this morning, all of 9am, and then it was rise and shine so we could get back on the road again. We estimated about 5 hours for the drive so we decided to let some spontaneity enter our schedule, if by doing so we just don't completely negate the whole idea of spontaneity. Can you plan to not plan or is that an oxymoron? We filled up at the Pemex and headed out of town. The drive was supposed to take us along the coastline for the majority of the drive. Eva had told us to wait until we passed through Ciudad del Carmen and went over two long bridges before we stopped to look for a beach. Today's lunch was peanut butter and grape jelly sandwiches. We stopped at the Bodega Aurrera when we reached Ciudad del Carmen and bought a couple bags of potato chips and lunch fixings for tomorrow. We try to eat cereal and whatnot for breakfast, some kind of sandwich for lunch, and then eat out for dinner in one manner or another. After crossing over the two very long bridges that remind me of driving through the Florida Keys, I spotted a beach that had some sand and one other vehicle parked under a tree for shade. Jose of course wanted to keep driving and look for a better beach because the water looked brown in one area due to all the tree vegetation that was floating in it. We walked down to the beach and it was covered with millions of seashells so forget the water, the girls and Sara started walking along the beach and collecting shells. Let's hope there is not some national law against it that I'm unaware of. As it is, the car now has a lovely funky smell to it. 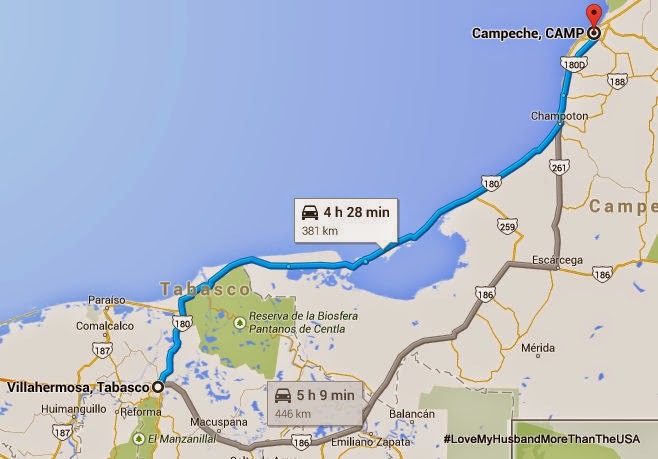 Next stop after the beach was finishing the drive to Campeche, Campeche; the 6th state we've visited on this trip. Remember, we have no hotel reservations so we do a quick google search to get an idea of where the hotels in town might be and we start driving towards the boardwalk. I pulled into a huge playground just across from the boardwalk so the girls could get out and play for a bit while I searched the web. And then what started out as a few drops of rain turned into a flooding deluge that filled the streets and then some. Jose was having to get out in the pouring rain and run in to check prices for a room. I think we asked at 5 different motels/hotels until we hit the budget jackpot. A double room for only $300 pesos and a secure parking space. There was no WiFi, AC, or cable TV but it fit our budget and that's all I cared about. We hauled the campstove upstairs and I made a pot of Bear Creek Creamy Wild Rice Soup and we kicked back to watch the rain pour down. Today's expenses were: 800 pesos for gas for 241.7 miles, 25 pesos for a bag of ice, 192 pesos in cuotas, 300 pesos for lodging, and 42.45 at the Bodega for one day's supply of snacks. Total expenses equals 1359.45 which still puts us over budget but not terribly.